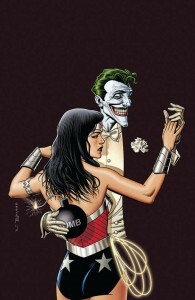 Recently, DC Comics started circulating June’s variant covers that feature the Joker across different comic book series. The aim was to celebrate 2015 as the 75th anniversary of the Joker. Only things have gone a little wrong. The art across the covers was pretty great, so it wasn’t that. What DC got wrong was the tone on a couple of covers. Look at how spot on the Catwoman cover is, or Aquaman’s or Superman’s faux wedding. Then look at Batgirl’s cover, and to a lesser degree Wonder Woman’s cover. The tonal difference is stark. The Wonder Woman cover missed its mark. She looks so unhappy, not at all empowered, and yet this is Wonder Woman. You think Superman would be in this pose on a front cover? Nope! Then why is it OK for Wondy to be subjected to this? She could snap the Joker’s wrists, or fly straight up, throwing the Joker and the bomb away (some days you can get rid of a bomb). She’s one of DC’s main, flagship characters. And yet here she is shown without agency. The Batgirl #41 variant by Rafael Albuquerque is well done artwork that harkens back to The Killing Joke. It’s a comic I know well—I had a first edition TKJ. (A relative threw it away along with many other comics I’d left for them to look after when I immigrated, including a complete first edition collection of Akira. Yes, I’m still bitter about this) I don’t question the skill of the artist. Like others on this site, I question the tone of the art and why DC executives initially approved, or encouraged, the use of this image. It was posted everywhere; the Batgirl team were unhappy, the artist requested that DC remove it, and DC, to their credit, did so. I’m not going to cover *ahem* the controversy in depth. But why did the controversy matter, and what does it show about the current maturity of the comic book industry and fanbase? Comics struggled for years to be taken seriously as an art form that has something relevant to say. They were dismissed as “just for kids,” and derided by mainstream media. It wasn’t until the early 90s that this changed with the publication of The Dark Knight Returns, Watchmen, and The Killing Joke, among others. They showed that comics could deal with “emotionally adult” stories. Progress was made, and comics started on the long road toward growing up. The next decade saw comics get gritty and try to almost exclusively appeal to young boys who loved costumes with pouches; they were the industry’s tween years. The response to the Batgirl cover controversy shows that comics have moved on from the myopic attempt to just aim at boys. Comics have continued to grow up while no-one was paying attention. Women and girls, 51% of humanity, are buying more comics than ever before, non-geeks are also buying comics, and all ages comics are appealing to families of readers. Other media now review comics in the same way they review movies or novels; the disrespect and snideness has gone. This is great, exactly what the industry wanted for decades—comics are taken seriously! With this increased social reach and appeal it has meant that comics are now critiqued from many different sections of society. So when DC put a helpless tortured Batgirl on the only all ages feminist comic in their lineup, it needed calling out and people did so in droves. It was a jarring tonal misstep that underlines how far comics have come and how far they still have to go. Comic dinosaurs ranted about how the inspiration for the cover, Batman: The Killing Joke, is sacrosanct and about how Wonder Woman’s new costume not showing off her behind is “like the Taliban has dressed her.” They claimed a “vocal minority” is “ruining comics.” Some of the fanbase will always be immature, of course, but some of the creators have also failed to grow. Each month, I buy a mix of independent comics and Marvel comics. Batgirl is the first DC comic I’ve bought in a couple of years and I was excited to read the reboot as it was aimed at her peers. Batgirl is a mainstream, all ages feminist comic—with a trans background character no less—that DC is publishing monthly. It’s something that should be celebrated. I enjoyed the tone of Batgirl as it fit nicely in with a comic book tradition in my family, I would read the comic, then my daughter would read it. Then we’d talk about it, we both enjoy that routine a lot. My daughter reads Ms. Marvel and Squirrel Girl and loves them both. She was loving Batgirl too, but I put that on hold after the debacle of #37; I waited a couple of issues to see if the creators mis-stepped again, and when they didn’t, Batgirl was back on my pull list. The variant cover incident showed me that my support for Batgirl’s current team was not misplaced; they have been great throughout this whole mess and even DC, masters of foot in mouth contortion, released a good statement that called out the verbal abuse by some of the comic dinosaurs. Let’s welcome back accessible fun comic books! The comic book mainstream is recognising that both society and the comic book buyer have changed. DC didn’t mean to create more division within both the industry and the fanbase, but they did, and it’s been both awful and heart-warming. It did show that most creators and fans are more socially aware now and this is great news; it’s another sign that comics are maturing. No one is saying that every comic has to be all-ages, or that edgy comics cannot exist. Let’s have a balance here; all-ages comics, feminist comics and, yes, even some bro-comics can all exist at the same time. The comic book industry is changing to reflect the maturity of the creators inside the industry and in the marketplace. I hope we’re seeing the end of the woman-in-fridge trope epitomised by The Killing Joke. All ages comics are really important to bring in new readers and fans, and comics aimed at all genders, or people that identify as girls, are even more important. It’s a whole segment of the market that’s still underdeveloped. I want my daughter to be a fan of comics. I love talking to her about the latest issues of the comics she reads, but it means publishers have more responsibility now. 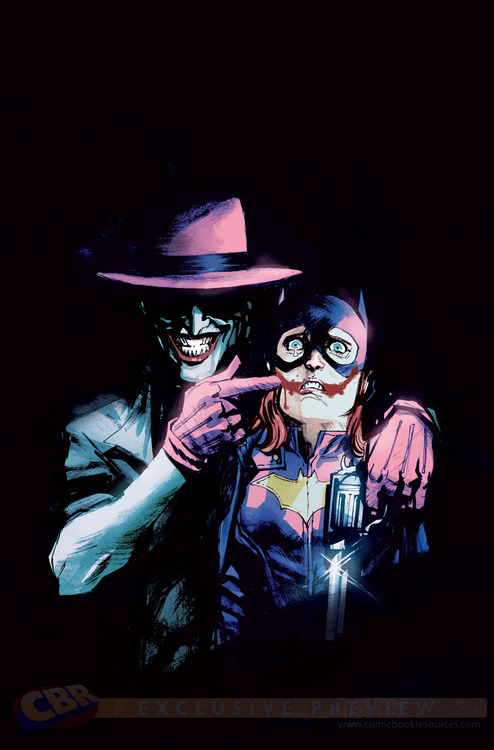 Batgirl’s variant cover controversy mattered because it broke the trust that new readers had placed in the title. The industry is still having growing pains, but I believe full maturity is around the corner. Both independent publishers and Marvel Comics have shown that widening your appeal to more than just young boys is very profitable. If those in or around the industry fail to keep up with the times then they will be left behind. They can go be dinosaurs elsewhere and leave the mainstream, because it is no longer all about young boys. A number of all ages comics exist now that we can read as a family, and it’s a great time to be a comics fan.